﻿ Category:Potion Istaria Lexica :: Your resource for Istaria - Chronicles of the Gifted! Potions are consumable items. They are crafted by Alchemists using the Alchemy skill with a Mortar and Pestle and a Cauldron. To craft potions it needs resources like: glass vials, tools and suspensions. 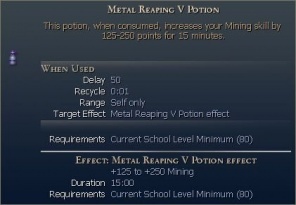 Potions are useable items and add buffs to the character, like a bonus to strength, resistances, mining skill or adding heal over time to regain players health. Potions can be used by all schools and races as long they fulfill their level requirement. Original material from istaria.wikia.com by Jessolt -- licensed under the CC-BY-SA 3.0.